Giuseppe is really easy to work with. We Recently completed a Pool and Spa project with Gappsi on a Estate Home in East Hampton Village. The Design and Quality of the pool is amazing!! We had a major multi-phase project planned including new deck, hot tub, 2 pergolas, patio, pool, and paver driveway/walkway. My wife, who is very detail oriented and has good vision of what she wants, shared with Giuseppe. He listened and late one night prior to going on vacation, came up with another set up plans, that while not completely what we projected, we were blown away with the conceptual view he created and agreed. The total project was a lot of moving pieces and with different crews and took more time than we wanted, some admittedly related to weather but I also thought the Gappsi was much in demand. That was the disappointing part of the project outside of dealing with the town, but I must also say that the quality of work and the final results were better than we expected. Giuseppe takes great pride in his work and that of his team. Martin and Peter did an outstanding with the deck, the patio/driveway and pool came out great. We were also referred to a Landscaping partner that did a great job and provided very useful information. I never take the time to write reviews but I was truly impressed with Giuseppe’s professionalism and commitment to providing a project exceeding his customer’s expectations and I appreciated his personal involvement with any little issue that may have come up. If you want a high quality outdoor project, you can’t go wrong with Gappsi. They will put in 100% dedication and plenty of experience to get the job done right and your project will stand out from all the rest . Hands down you will be satisfied when project is completed and you will use them again . Professional and beautifully done job. I had Gappsi do the patio around my pool as well as masonry on my front steps. The work was done perfectly. His workers were very professional, on time and neat. They also followed up with any repairs that I needed done. I highly recommend this company. My experience with Giuseppe started before he was Gappsi many many years ago when he first started out and did work for my parents. They were very pleased. Naturally when I was searching for a company to install my pool and do masonry work I turned to Gappsi in 2011. Giuseppe was involved from the beginning. The work came out great. Gappsi did a complete pool, patio and driveway installation using granite pavers. Several years later I needed some additional masonry work done and once again turned to Gappsi and without hesitation they completed the work. Guiseppe is available if problems arise and works to address them quickly. I recommend Gappsi and think you’ll be pleased if you choose them too. Our experience with Gappsi began in August., 2017 and it was purely by chance. My husband found their website, and dropped by their business after setting up an appointment with another pool builder down the block from them. Immediately upon walking into their place of business, he received a hospitable reception which gave him the “warm and fuzzy” feeling he likes to get when doing a business transaction. This is his indication of an honest, trustworthy company. And his intuition proved to be right. Having spent months prior doing research, we knew exactly what we wanted, a gunite pool to fit the existing landscape of our nice sized yard. The owner, Giuseppe Abbrancati, came out, took notes and pictures of our yard, and within a week, had computer generated renderings, which we were able to modify on the spot. Giuseppe and his son, Emmanuel, did a phenomenal job at giving us exactly what we wanted, instead of trying to sell us on the expensive add-on features that we didn’t want. And what that enabled us to do was go bigger with our free-form design, one of the largest residential gunite pools they had done and at a very reasonable price. The only major hiccup was when their project manager had to be replaced, but once that hurdle was overcome, the newly assigned project manager, Tosh, made sure getting our pool, the gas lines, the electrical, the masonry, the sodding and landscaping were all completed in time for the opening of our pool in June, 2018. We are delighted and thrilled beyond measure at our resort style backyard. We would recommend Gappsi, a family run business, to all!! Thanks for making our home the “destination stay-cation” of Coram, NY for our family and friends!! Everyone is in awe when they see it! Giuseppe, Tosh and their team did a wonderful job building our pool. They were easy to work with, addressed all of our questions and were very professional. Our pool looks amazing. I can’t wait for summer! I would highly recommend them. If you want brick or stone work done on your property, call Gappsi, they know what they are doing. In 2006, owner Giuseppe designed beautiful patios and walkways around my house. This year, we ran into a problem with the walkway covering the septic tank which needed attention. After our contractor purged the septic tank, the Gappsi crew with operations manager Jeff Jimenez, worked with me to get the walkway put back together. What a great job. Is very hard to discern that any work was done. In addition to the excellent technical work, Jeff and the Gapssi crew were quick, reliable and polite. It is very refreshing to know, that after the installation 12 years ago, Gappsi stands by their work and their word. I am so delighted to have met such a wonderful company to seal my pavers. Everything was explained to me and any of my concerns were taken care of. The crew was extremely nice as well as Jeff who gave me the estimate. I would recommend them to anyone for their project. Gappsi did my patio area in the front and back of house several years ago and when I called for some minor repairs they came back and took care of it. The crew run by Jeffrey did a fantastic job and I highly recommend them if you need a patio done by a reputable company. I had a batting cage installed in my backyard. All the guys were great. Professional service, professional installation. My son and I couldn’t be happier. Gappsi is the best!!! They installed Travertine stone around our pool area and patio in 2008 and not single stone has moved. They came back 2 years ago to seal it and it looks brand new. Their design and craftsmanship exceeded all of our expectations. We even had them back 3 years ago to replace our driveway and front walk. Giuseppe has surrounded himself with courteous and professional staff. Phone calls are returned promptly, they show up when they say they will and they complete the job from start to finish, without running off to other jobs to leave you hanging. Very professional and at a competitive price! I have recommended Giuseppe to many friends and will use his services again in the future! I have done a major job, new landscaping around the whole house, and redone a Gunite pool which had been closed for 14 years. The pool was a total disaster! Gappsi came, they quoted, they were hired. Everything went as smooth as silk. No surprises, No upcharging, No Mess, cleaned up as if they weren’t even there. ZERO complaints! They created a whole new living experience! Would highly recommend! Gappsi is # 1! GAPPSI installed my Patio, Pool Patio and Driveway in 2007….The work has aged very well, however, from time to time I have needed a few repairs, each time GAPPSI responded promptly and made the repairs, no Questions asked…..Service is the name of the Game and they always give me great service. Thank you GAPPSI! We had Giuseppe do our patio, pool and walkway back 2001 with Nicolock pavers. His crew did a wonderful job and we loved their workmanship. Giuseppe himself designed the entire patio, pool stone work and walkway. Actually, we gave him full go ahead to do the design and we could not have been happier. Nine years later we moved into a brand new home and of course needed to put a patio and walkway in our backyard. Also, we decided to add a firepit. So in October 2009, we called Giuseppe to do the job. This time we used travertine and also let him design out the patio, walkway and firepit. No doubt about it —– another terrific job. We could not be any happier with the job his crew did. I would love to put a pool in and if we ever do we would have Giuseppe do the job. We would highly recommend Giuseppe and his crew to do any and all patios, walkways, firepits and pool stone work. Thanks Giuseppe for another great job!!!!!! Our first encounter with Giuseppe occurred almost 14 years ago when another contractor left us with a pile of material and unfinished work. A friend recommended we contact Gappsi. After visiting our home and seeing our plight Giuseppe told us not to worry. Within days, he and his crew were at our home removing all the substandard work and installing new pavers around our pool and constructing a new patio. The workmanship was superb, the workers very professional, and the workmanship superb. When it came time to have the patio and walkways cleaned and sealed we again contacted Giuseppe. The cleaning and sealing process they used brought a second life to our pavers. We recently called on Giuseppe to install a dog run in our yard for our puppy. Jeff and his crew did an excellent job and accommodated all of our requests. Our puppy loves his new run and enjoys running and playing mud free. We strongly recommend Giuseppe Gappsi. If you are looking for quality products, workmanship and someone who stands by their word, we strongly recommend Giuseppe Gappsi. Jeff and the Gappsi team were as good as it gets. They did an exceptional job building and installing a customized basketball court in my backyard. They were professional, courteous and extremely competent. I would highly recommend Gappsi! After doing much research to build a sports court in our yard, we were very happy we chose Gappsi to do the job. The sports court has a synthetic grass perimeter that really compliments the multi sport court. We play pickle ball, shuffle board, badminton and volleyball and we also roller blade. Jeffrey our salesman came through with flying colors! And as a team him and Giuseppe also incorporated paving stone around one end of court and a beautiful flower bed burm on the other end. They also sealed our driveway that is over 20 years old and brought it back to life… it looks like new!! They did everything promised, which is not common when working with contractors today! Highly recommend… use Gappsi for your next project! The team from GAPPSI did a terrific job. We had an extensive amount of masonry work done as well as installation of a pool and waterfall. We worked with Giuseppe on the overall design and installation of the pool layout and waterfall design and installation. Each division worked with us to provide their experience and concepts yet also reflect our ideas in the design and complete it on schedule. The crews that did the installation was excellent and we believe their craftsman and attention to detail was reflected in the end product. Gappsi also supplied a limestone diving rock and the all swimming pool patio was built with classico travertine and the pool coping was constructed of Hanover chapel coping. The job included a front entrance walkway as well as side entrance along with a large patio and free form pool masonry. Additionally, they were able to incorporate the pool masonry into the patio in a seamless manner. The lead man the on-site masonry team was great and understood how to adapt the job as necessary and keep us informed. Our objective was to make sure that the overall job when complete would reflect quality and also a tranquil and clean look. The GAPPSI team certainly accomplished this and we would recommend them to others considering such work. You guys are a class act!! Congratulations on a job well done! Your 911 memorial at the Commack HS truly encompasses who you are, and shows your dedication to our surrounding communities! If I have a project coming up, you will be the first to know! You are masters at what you do!! Gappsi did the patio and retaining wall around our pool and matching planter boxes for sheer descends. It was a pleasure to deal with them. They did the design and guided the project from the beginning to the end. They delivered everything we contracted for at the price we agreed upon. In fact, the finished product exceeded our expectations. I would recommend Gappsi to anyone. After a careful research for a company that will incorporate a free form pool with a safety retractable cover, we arrived at Gappsi, one stop shop for our dreamed backyard. Gappsi has an excellent resource in place to produce an astound design in three days. They mobilized men and material to site. They built the swimming pool and completed it with the installation of the auto cover. The masonry crew then installed the selected travertine pavers for the entire back yard patios they were amazing. They installed 2 inches travertine coping for the pool and the pool cover box; they built a raised patio by the sliding door as we enter the back yards with round steps going down to the pool patio. And light pears on both side of the steps, they installed a fire pit and a barbecue bar combo with a pergola built over the cooking area. The landscaping crew re-vegetate the property with evergreen trees planted along the fence perimeter to meet town codes. My family and I can say that we recommend the Gappsi team to anyone for design and build because they presented us with a completely different way to look at our backyard and fulfilled our desire to commune with nature. Initially, my husband and I wanted to only redo our front stairs. We had several contractors give us quotes, but no one could design what we were visualizing. Giuseppe at Gappsi changed all that. He worked over all the problem areas and did a better design than we imagined. When we visited the showroom, we decided to extend our project: we did our driveway and added a side patio. We used amaganset 6×9 flamed and tumbled granite paving stones that we selected from the gappsi showroom for the driveway, the walkway, and for the border of the backyard patio. We absolutely fell in love with and used large French pattern naturale travertine pavers for the patio. We also added Hanover tan blend for the seating walls in the backyard and for the front stoop. Gappsi even handled the landscaping. Besides a great design, the team that worked here daily was so professional and friendly. We would recommend this company to anyone. They truly were a pleasure to work with! After meeting with several local pool companies on the island for our dream pool and backyard we were blown away with Gappsi from the initial meeting. From my first encounter with Giuseppe I could tell that he was an honest business man who was looking out for the customer and the needs that suited them and not what he thought he should sell us. Giuseppe spent much time answering ALL my questions about the pool and the construction of it, providing digital renderings based on our conversation, explained in full depth the functionality and safety of the automatic pool cover and the salt water system. We have two small children and the cost of the pool cover could never replace something happening to our children so we were happy that the choice was available to us. Other companies we met did not even mention this to us. Gappsi has the forms for the built in pool cover box and they have the installation down to such a science its remarkable. I highly recommend anyone with small children or safety concerns to make the … companies on the island for our dream pool and backyard in 2010 we were blown away with Gappsi from the initial meeting. From my first encounter with Giuseppe I could tell that he was an honest business man who was looking out for the customer and the needs that suited them and not what he thought he should sell us. Giuseppe spent much time answering ALL my questions about the pool and the construction of it, providing digital renderings based on our conversation, explained in full depth the functionality and safety of the automatic pool cover and the salt water system. We have two small children and the cost of the pool cover could never replace something happening to our children so we were happy that the choice was available to us. Other companies we met did not even mention this to us. Gappsi has the forms for the built in pool cover box and they have the installation down to such a science its remarkable. I highly recommend anyone with small children or safety concerns to make the investment in the cover. With the automatic pool cover it allowed us to have the pool steps be built across the entire shallow areas width which makes it more accessible and comfortable to get into the pool and also allows for seating benches on different heights for adults and children. For the patio around the pool we were originally going to do traditional pavers as that is what we thought the available option was to us. Well after meeting with Giuseppe at his showroom a second time he educated us on travertine and I fell in love. The no slip, heat resistant benefits are unbelievable and the color options and designs are amazing. We used the moca colorafter talking with Giuseppe we also ended up removing an existing paving stone patio and walk way that we had installed a couple of years ago and used travertine for that as well. They used 2 inch thick moca full nose for the pool coping and also for the automatic cover box .Our cover retracts under the patio at the turn of a key and I can’t wait for spring time to start using it and making it a memorable summer for our children. Gappsi is a one stop shop and we used them for our driveways and hydro seeding in spring 2011 . You are crazy if you don’t go with Gappsi. The crews were unbelievable. Answered every question, always on time and very neat and when they left it was like they were never here… Call Gappsi for all your needs. Landscaping, Masonry, Construction, you name it. I promise you won’t be disappointed. My wife and I were looking for a qualified and qualified company and contacted Gappsi for an estimate to remodel our front and backyard. They designed a 3D concept for our project. The backyard consisted of multilevel patios and retaining walls. Gappsi created the entire project starting with the construction of the swimming pool…All the retaining walls and pavers were constructed using Nicolock. The retaining walls were Oyster Blend mini colonial walls with Travertine inlay. The walkway to the front of the house, stoop, driveway and additional retaining walls for the planter beds were constructed using Nicolock country pavers. Gappsi also installed the PVC fencing for the entire property being that the fence was installed to follow the different levels and heights of the retaining walls it was a total custom fence job. From Giuseppe, to the crews the project was handled seamlessly. We could not be happier with the finished design. Thanks! It is a no brainer for me to endorse Gappsi. I had work done on my pool and the surrounding area. I approached several contractors to provide ideas and concepts for the major renovation that I had planned. I selected Gappsi and was not disappointed. The job was handled in a professional manner. Questions were answered, work was done as promised. My backyard was transformed into a park environment. We used the backyard from the day the project was finished until October. I am planning additional work and will be calling on Giuseppe at Gappsi once again. Masonry structure sign donated and built by Gappsi for Arrowhead Elementary School Setauket Long Island NY. We hired Gappsi to design and install a swimming pool in our back yard. It was a challenging job because we live on the water and we have a high water table, even though we did not want a diving pool they had to do a dewatering system. Our pool has steps across the entire shallow area that we use to go in and out of the pool as well as sitting on them as benches, they have thick soft cushion under the liner so sitting on the steps is comfortable. In the deeper part of the pool they built a ledge across the back pool wall so when the kids swim across to the deep end of the pool they can stand on the ledge without hanging and holding themselves up from the pool coping. Gappsi installed a 20×40 rectangular pool with an automated swimming pool cover, we have small children and animals so our pool is safe and stays clean and the water stays very warm without having to run the heater as often, we decided on the dark blue cover for its looks but it turns out it generates heat from the sun and keeps the … design and install a swimming pool in our back yard. It was a challenging job because we live on the water and we have a high water table, even though we did not want a diving pool they had to do a dewatering system. Gappsi introduced us to travertine pavers which we decided to use for our entire backyard patio as well as the pool patio. The Travertine is not only beautiful and one of a kind, it is also not slippery and does not get hot in the sun. Starting with Giuseppe designing the backyard, we were very happy with the entire project construction. We had to deal with only one company for all of our needs and the job went swiftly and seamlessly. The entire crew at Gappsi are very talented craftsmen and were all just as happy to see our project come together as we were. They created a pool and patio to accommodate all of our needs and made suggestions on materials that we couldn’t be more pleased with. The Backyard of our Dreams From the beginning to the very end and even now, we couldn’t be more thrilled with Gappsi. They took a barely adequate backyard and turned it into a magnificent retreat for our family. The pool, hot tub,, bi level patio, pool deck and landscaping came out beyond our expectations. The compliments we recieve are never ending and those who saw the before, cant believe the after. A comment we frequently receive is “you are the only people we know who put in a pool and your backyard looks bigger” The staff were here everyday all day, and were the utmost professionals. Giuseppe was hands on and available at all times. We were so thrilled with how our backyard came out we followed it up with Gappsi doing our front stoop, walkway, driveway and landscaping, and again couldn’t be happier. We would highly recommend Gappsi and often do.. In 2005 I probably was in over my head and I was attempting to be the general contractor in a major renovation to our home in Manhasset Hills. My wife and I were very pleased with how our home was shaping up on the inside but it was time to tackle the front of the house. We did have an architectural drawing and plan but I was not overall pleased with the look of the front stoop and retaining walls on paper. But at least I could get some estimates and ideas on how to proceed with this huge job. I meet some really talented masons during the process but none impressed my wife and I more than Giuseppe the owner of Gappsi. We took a look at some of his work. Including our neighbor and we were impressed with his creativity in every job. I knew that creativity was vital to the overall curb appeal of our home since the homes in our area generally look the same. In about a month and a half gappsi designed and installed the front of my home in 2005 this included our front stoop, retaining walls, driveway, side steps, patio and pathway leading to the pool. We have had multiple compliments throughout the year about how nice the front of the house looks and a major part of that I would have to say is due to Gappsi’s creative design and expert installation. Six years later and the job looks as good as when it was completed in 2005, Gappsi created that grand entrance I was looking for from the beginning. To Giuseppe Abbrancati I can’t tell you enough how pleased we are with the pool, patio, fireplace and retaining wall Gappsi built. The difference in our property has been tremendous. We have received so many compliments and one of the best and “most frequent compliments” is the backyard should be in a magazine such as Architectural Digest or House Beautiful. We love it even in the winter when the pool was closed it’s magnificent. Regarding the construction and all the aspects from beginning to end I can’t stress enough how “stress less” this was. From the time of our first appointments with Giuseppe right to the completion, we received everything we contracted for and more. I have been involved with construction many, many times and we never ever had to come home to find something was not done right. The excavation, pool walls, leveling, removal of dirt, trees, forms, electric, gravel delivery, stone delivery, design of patio, fireplace, outdoor kitchen walls, stone decorative walls, coping and every other piece of the project completely 100% of the time we never had a problem with the completion not being exactly as we discussed during our appointments. We had many different aspects and the crew was one of the most professional and especially expert in their trade. The crew was unbelievably competent, hardworking and never left the site with any tools, broken stone or anything dangerous in an area where we might walk when they were not present. They worked straight thru from the minute they showed up around 7:30 AM and usually left around 7:30 PM. If I didn’t have noise from the bulldozers, tools, etc., had in the yard I would not have known they were working. They were instructed to build the design we worked out and they knew exactly what to do. The entire stone, walls and retainer walls final product look as if they were always there. The electricians came in and worked right up til dark to get their work completed and totally cleaned up inside and out when they were through. If I didn’t see them there myself I would not have known they were there. The crew were so expert even with the additional electric lighting when all was done it was perfect. The pool was a little larger than the average size and that crew paid such close attention to everything with each and every form they inserted, measuring, pouring concrete, checking and re-checking consistently. The pool was completed to perfection including the stairs, stone, lights, filter, heater and liner (without any wrinkles in the final installation). The electric pool cover was something we had not originally planned for and we are so happy it was explained to us. If we had not done the electric pool cover, we would constantly be cleaning and heating the pool. Again it was a slight challenge due to the extended size of the pool, but attention to every detail and research was done to be sure it would be implemented correctly. It was and it is well worth the extra cost because it saves in the long run. I would highly recommend this. Giuseppe promised to deliver the entire package with the various experts all pulling together and he did. I would more than highly recommend GAPPSI in pools, patios and any home improvement contract is works on. Their will be no stone unturned or unfinished. We did change a few ideas during the job and all we needed to do was a meeting to confirm it was structurally a good idea and the design change was immediate. This is like the academy awards Giuseppe! I hope I have mentioned everyone and all aspects of the job to thank everyone involved. It was PERFECT! As I mentioned before, I have been involved in home improvement in the past and totally know how contracting can go wrong from ideas to the crew themselves. GAPPSI made the work and project stress free. Thank you sooooo much !!!! My wife and I wanted a truly custom pool and patios. We didn’t want brick pavers. Giuseppe came up with a wonderful design including the use of Travatine Pavers for a custom design two-tier patio. They created the shape of pool that we wanted including sheer descents. We were concerned about meeting the completion deadline due to the fact that we were having a party at our house and Gappsi guaranteed and met the deadline as promised. We love our pool and patios and appreciate the professionalism that Giuseppe and his staff showed to us. Words cannot express how delighted we are with the work that Giuseppe and the crew at Gappsi performed in the transformation of our backyard. After interviewing numerous pool companies, we met Giuseppe and knew immediately that we had found the right company for us. The pool (with automatic cover), travertine patio, pond, waterfall, fire pit and cultured stone walls Giuseppe and crew designed are truly masterful. The expertise and advice Giuseppe rendered during the design of our pool was invaluable. The creation of our travertine patio and pond with waterfall is truly breathtaking. We were extremely pleased with the attention to detail and every aspect of the entire construction process exceeded all our expectations. I can undoubtedly say that Giuseppe and the entire Gappsi crew were extremely reliable and professional throughout the entire process. There were never any issues with communication and they always delivered upon their promises. We can’t express how many compliments we have received from all our friends and family regarding their work. Thanks to the efforts of everyone at Gappsi, our backyard has been transformed into our own little paradise. We can’t thank them enough. It goes without saying that we highly recommend Gappsi to anyone and everyone that is looking to experience excellence in design, customer service and workmanship. Let me start by saying I am a very picky person. I try to do everything myself so it is done right. When I have to hire a contractor to work in my house, I watch them very closely to make sure it is done correctly. That being said we met with all the contractors in our area. We finally decided on Gappsi. We just moved into this house, so we needed lots of help with the layout and design. The people at Gappsi spent hours helping us with the layout. When we finally decided on a design we signed the contract. We change the design four times before the installation. Each time the people at Gappsi were very helpful. The employees that installed the pool were very respectful to my property. We decided to install a slide instead of a diving board. When the slide arrive they are unpacked and assembled it. After it was assembled my wife and I did not like the way it looked. They let us choose a different slide even though this one was already assembled in yard. Next came the patio, again the contractors were very respectful for my property. As they were installing the patio my wife and I change the design on them. They accommodated us without issue. The construction crew work long hours, late nights even Saturday and Sundays to get the job done promptly. We were so happy with the end result we decided to have Gappsi pave our driveway. Over the winter some of the stones shifted around. So I called to let them know what happened. Giuseppe (the owner) got back to me personally. He sent a crew to my house and they corrected the matter promptly. Gappsi does an amazing job from the beginning stages of design to completing the project. They also focus on customer service. You will love the end result!! Gappsi, installed my paver stoop, landing and driveway in 2008 it has stood the test of time. I’m still getting compliments ten years later. A couple weeks ago Giuseppe’s crew powerwashed my hardscape (at 200 degrees), sealed it etc. It was like putting your driveway through a car wash…it looks brand new again. Jeff and Willie are good names to remember for top notch service. Beneath many driveways and patios you’ll find plumbing and electrical lines. Should you ever need to access them, you’ll want someone who can put the pieces back together again. My neighbor found himself in that situation and his contractor is out of business; good luck finding someone to do that job. Giuseppe learned his trade in Italy, now the family run business continues on LI, they’ve been around for a while. Should I ever find myself in that situation I’ll trust Giuseppe will be there. Gappsi did our pool 3 years ago and we had some travertine break and crack due to NY winters. His crew came and replaced every tile cracked. Amazing customer service! Best service . Always a FAST response and really goes the extra mile to make sure EVERYTHING is taken care of and done so in the most pleasant and efficient manner . Giuseppe makes himself available at all hours to answer questions and resolve issues one might have . Really stands by his work and committed to making the customer stratified . I highly recommend Gappsi !! Gappsi installed our gunite pool on time and within budget. everyone raves about how beautiful our pool looks. Owner is a gentleman. Great Job! My family and I would like to send our sincere thanks and appreciation to the GAPPSI team for our pool and home project. The guidance and expertise at GAPPSI IS FANTASTIC. I would like to extend a special thank you to Giuseppe for his work. He has gone above and beyond for us. We look forward to the finished project and many years of enjoyment in our home Oasis. I am writing this letter to let you know what a good person and business man Giuseppe Abbrancati is. I know Giuseppe personally and as a business associate. I met Giuseppe 8 years ago when he came to my home to give my wife and I an estimate for a Swimming pool. When he came over that day I did not foresee that NOT ONLY would this gentleman being doing my Swimming pool, but I would be proud to call him a friend as well. Giuseppe was professional, caring, intelligent, and very passionate about giving, us, the client the HIGHEST QUALITY of workmanship possible. Giuseppe was with my wife and I every step of the way in creating one of the most beautiful backyards I have ever seen. And I am very proud to go in my yard every day and see how it has transformed from dirt into an oasis. Not only is Giuseppe an honest and professional businessman he is also a good person and a family man. He is one of the hardest workers I have ever seen. Giuseppe came to this country when he was 21, without family, and not speaking English, to follow the American dream. He taught himself English, worked 24/7 to teach himself all phases of paving and masonry work, all while raising three beautiful children with his wife of 27 years, Caterina. He now owns a very well-known company that has an outstanding reputation for its honesty, integrity, and workmanship. Giuseppe also gives back to our community, he has donated marble benches to almost all of the schools in Suffolk County. He also donates landscaping to help keep our communities looking beautiful. As far as I am concerned, I am very proud to know Giuseppe Abbrancati, you don’t get to know many people with his kind of integrity. When we decided to put a pool in last year we loved Gappsi’s ideas right from the beginning. Giuseppe’s vision for our backyard was exactly what we had imagined. The pool, the spill over spa, the stone work, landscaping, and the bar turned out just perfect. It transformed our yard into a resort! Giuseppe was an absolute pleasure to work with; I look forward to our next renovation and working with the Gappsi team again! Excellent workers. Very honest and professional. I love my pool. It is truly beautiful. Thank you. Gappsi did an amazing job. From the first meeting with Giuseppe I knew I had made the right choice. Gappsi offered the best price and quality to install my gunite pool. Giuseppe met with us to go over the design. Giuseppe did an amazing job accommodating my 4 children, he designed the gunite pool with a sundeck with shallow water, there is also an amazing spa for my husband and I to relax in while the kids are in the pool. Not only did Gappsi install this amazing pool, they also installed artificial turf around the kid’s playground. The grass looks and feels so real, it’s clean and safe for my children to run around in. The Gappsi Team is great. Thank you Gappsi for providing my family such great service. Can’t wait to start the next project with you guys! Backyard Resort… Giuseppe and his staff at Gappsi helped us to create our own vacation resort right in our backyard. The quality, attention to detail, and craftsmanship of his work was truly outstanding. He and his team were exceptionally professional and respectful as well as attentive to all of our needs and concerns. Gappsi installed a oversized free formed pool in our back yard, with spill over spas positioned on a second level patio built right next to the swimming pool. The crab orchard mini colonial wall used for the raised patio walls and light piers blend with the the naturale colors of the random pattern travertine as they where meant to be together, also 4 lions head wall sconces were installed, 2 on each side of the spa. After the installation of the back yard we had Gappsi install a new driveway and the entire landscape for front and back yards. from designing to the last question of the project we did not have to deal with anyone else but Gappsi. We would highly recommend Gappsi over and over again with no hesitation. Installed K-9 artificial turf… the BEST decision ever and Gappsi was pleasure to work with. Our fur boys love running around and we love having NO dog paw prints in house on a daily basis. A win win and having Gappsi to do the work was a true score !!!! They also redid our patio area with installed fire pit and we love down time in our beautiful back yard where the grass is now always green! Our family and friends love hanging there. Thanks for an amazing job Gappsi ! I want to thank Giuseppe’s team for an incredible job well done! You guys really did amazing work and the pool turned out incredible. The process was efficient and the pool was ready for the beginning of summer. Your team deserves high praise and credit for completing this project so smoothly and delivering unbelievable results! We enjoyed working with the entire Gappsi group that installed our new Bocce ball court in our yard. The work is professionally done and the crew is extremely friendly and will do anything they can to satisfy you. The court was busy with players on the 4th of July. The Gappsi group is also very accommodating to start and finish the job quickly and on time. Well done. hot tub. We had them put in a waterfall on our existing pool and the marble dusting redone. It came out great and feels much smoother than before. Everyone is friendly and easy to work with. I would definitely recommend them. The whole team were very professional .The project was all orchestrated by their top salesman JEFF who went out of his way to please us in any way that he could. We will defiantly be using them in the future.Tom R (foxwood village) Thanks again guys job well done. We decided to hire Gappsi for our latest project because they are well known in our community as a reputable company. We couldn’t be more pleased with Giuseppe and the Gappsi team. As a owner, Giuseppe was always involved and on the job site to over see the whole process and to make sure it was up to the Gappsi standards. We hired them to install synthetic grass with a two inch thick foam padding for our children’s new playground. We couldn’t be more excited at the completion of this job. I have received numerous complements about our grass and our children love their new playground. We are already discussing hiring Gappsi for our gunite pool. I know we will be in great hands when we move forward with our next project. I have to say they were our first estimate and our last. Giuseppe, I would like to start by saying that the best decision that me and my husband made was to use Gappsi for our pool installation, deck, and driveway. We Searched around and spoke to many companies and Gappsi was the most Reasonable price and the most friendliest of the people that we interviewed. Gappsi installed a free form pool with the Travertine bricks throughout my whole backyard. We also put in a bar/BBQ area Giuseppe had the best ideas as to which bricks we should use and in designing our yard for us. We could not be happier with the final outcome. All the people that we were in contact with at Gappsi were all very friendly, and knowledgeable of all aspects of their job. All the workers that showed up at our home were very hard workers, and very courteous of all our wants and needs. I would highly recommend using Gappsi for your next upcoming project. I am certain you will be more than pleased at the job that is provided to you. Giuseppe and the whole Gappsi Family, since the latest phase of our pool project has been completed I can truly say that you’ve given us the backyard paradise we have always dreamed of. The transformation began on the very first day that Giuseppe came to our home. He envisioned a project that we could not fathom would turn out even close to what it did. Thank you, Gappsi so much for this fantastic journey. Words can’t describe how truly beautiful this project turned out. I will continue to call Gappsi first in the future for any needs we have and I would highly recommend that everyone else do the same. Take it from me. I actually work for a contractor that specializes in a different trade, but being in the business I understand where things could possibly go wrong. Gappsi stands behind their work and does a great job…the first time! Giuseppe designed the Pool of my dreams. The entire team was thoughtful, innovative and just amazing!!!! I could not be happier with the great things they did. I got a bunch of estimates from many different pool companies on Long Island but what made Gappsi unique was their quality to customer care and really listening to what I wanted. Thank you Giuseppe!!!!! We hired Gappsi to install a swimming pool in our backyard. With the help of Gappsi’s staff we designed a pool that is unique, functional and beautiful at the same time. After the pool was completed, we decided to follow up with the design of the patio surrounding the swimming pool. We chose travertine pavers from the Gappsi showroom. Giuseppe and Gappsi did a magnificent job on our pool and we are both very pleased with the finished product. His staff was helpful and diligent throughout the entire construction process. I would recommend using Gappsi to anyone who is considering a pool. Gappsi did an incredible job from the renovations of my entire home to the pavers design of my driveway and outdoor kitchen and fire-pit. They are reliable and very reasonable. I have used them on three different occasions as well as my parents in Dix Hills. They do not disappoint and show up when they are supposed to unlike other contractors. I would highly recommend them!. You will be very pleased with the results. My family and I could not be happier with the transformation of our backyard! It only seems fitting that I post this review the day after Thanksgiving because apart from being thankful for good health throughout the family this year, we are truly grateful to Giuseppe and his team at Gappsi. My family is now enjoying a completely transformed backyard. Friends and family comment that our yard resembles a resort-like setting. Giuseppe is a genius when it comes to making the best use of your space with a layout that could not be more spectacular if Pablo Picasso, Van Gogh or de Vinci came back from the dead to work the project. I really believe that! My family and friends know that I am a super particular ‘pain in the a**’ . Like most people preparing to invest their hard earned money into a major home improvement project, I spent a lot of time researching numerous options for this project, including multiple renderings that I spent days drawing myself. Early on in the project Giuseppe told me to relax and focus on my business and let him handle all the details. My best advice to anyone considering a small or major project involving masonry and stone work, is to save your time and energy and just trust this guy because he truly is an expert in his field. I would also add that his pricing is very fair. I have never put myself out there to make a review for fear that others may not receive the same positive experience that I enjoyed but in this case I believe that Giuseppe and his team are committed to a level of perfection that may even exceed that of some of his customers. These guys want to complete every project in a manner that creates another masterpiece to be added to their collection of show pieces and family of satisfied customers. GREAT JOB! Gappsi transformed our backyard into a resort! We were living in our house for 12 years when we decided to create an entertaining backyard. We met with Giuseppe to design a backyard paradise. We discussed many ideas and looked at different layouts. Working together we designed a plan that gave us what we were looking for at a budget we could afford. Gappsi put ideas to paper and gave us a computer printout of what our project was going to look like. Our project began with a top quality pool. Then came our masonry work, you will not find better masons then Gappsi. The most important part of the project for my wife and I was the pool house. Gappsi built a very functional pool house, where we eat dinner all summer long. Thanks Giuseppe , we love it! The project included a hot tub and fire pit to keep our backyard fun going all year long. Our wish list also included a half court basketball court (actually my kids wish list) which they use all the time. Gappsi is a very professional company that listens to its customers and truly tries to make each and everyone of them feel special and part of the family. We all have stories of less then professional contractors that we have dealt with; Gappsi is NOT one of them. Our experience with Gappsi was a pleasure. One of the smartest decisions we have ever made as homeowners was to choose Gappsi to install our pool and patio. Giuseppe and his crew transformed our backyard into a magnificent one with a gorgeous pool and numerous patios. His craftsmanship, expertise, and professionalism remain unparalleled. He has consistently attended to every detail since its installation, and we are absolutely thrilled with his work! Very happy with the job they did. They built a great pool and patio for me. Their work was excellent and I would use them again. 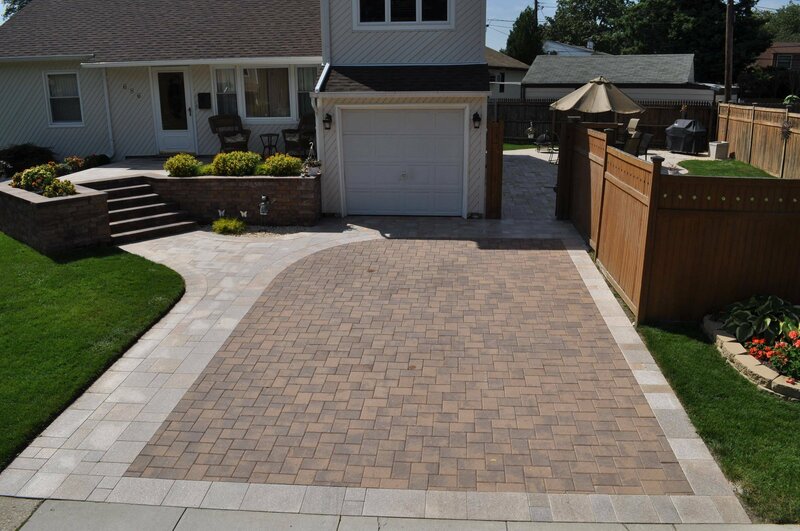 This is a letter of appreciation regarding the paver driveway installation and sealing at my home in Dix Hills. Both Greg and Jeffrey were professional and courteous from start to finish. The work product from them and their crews was top notch. I will be sure to not only use your company for future work including snow removal, but I will recommend your services to all of my friends, family, neighbors and colleges. Giuseppe did a great job helping us create the perfect backyard sanctuary for our family. The Gappsi Team worked hard to make sure the process went smoothly. Our beautiful gunite pool has a sunshelf, benches and swim jet. It is exactly what we needed to enjoy the perfect summer. The autocover helps to keep our pool clean with minimal effort. The light show makes night swimming extra fun. Our custom patio is the perfect complement to our beautiful pool. We are so happy with the results. Thank you Giuseppe and the whole Gappsi Team. Giuseppe did our inground salt water pool three summers ago. They did an amazing job. Not only is the pool incredible but Giuseppe has been awesome. I can call him or text him any time about anything and he responds immediately. I am so happy we chose Gappsi. Beautiful work and Fabulous customer service. Do work with them and they treat you like family. Highly recommend them. I recently used Gappsi for sealing my patio and driveway (also Gappsi-installed several years ago). Jeffrey and team were professional, courtesy, and knowledgeable. Best of all, the results were better than expected. Everything looks brand-new as if they just installed the stones yesterday! I have and would recommend Gappsi for any hardscape and rennovation projects you may be considering. After interviewing and meeting with several masonry and pool companies, we chose Gappsi. From the moment we first met Giuseppe and his team of professionals we knew we made the right decision. He made us feel comfortable from day one and addressed any concerns we had all along the way. In the end, our backyard was transformed into our own private oasis. I can not begin to tell you all the compliments we have received on how good it looks. Gappsi did a phenomenal job using both old world craftsmanship and old world business practices. Imagine that, they actually care about their work and their customers. I highly recommend Gappsi Group. If your thinking about renovating your outdoor living space then you should give Gappsi a call. They were the only company up to the task of rebuilding my pool and backyard. They even came back to fix a couple of pavers, years later. Giuseppe the owner is an honorable man. If you meet him you know. I highly recommend Gappsi. Honesty, Integrity and excellent craftsmanship. If you want your renovation done the right way; give them a call or better yet stop by their showrrom which highlights many of the materials they utilize…. We had our driveway and patio installed by Gappsi many years ago. We had them recently sealed by Jeff and his crew. They were totally professional from start to finish. Our patio never looked this good even when it was new. My wife and I are completely satisfied with the job they did for us. Gappsi has completed two major projects for us in the past several years. Giuseppe Abbrancati created our back patio in 2002 and it looked like the ones in all of the catalogs – still does. This is no coincidence since most of those gorgeous patios you see in Nicolock catalogs were built by Giuseppe. When it came time to install an in-ground pool, we called Giuseppe right away. Once again, the back yard was transformed into something out of a magazine. Everyone comments on how beautiful the pool and waterfall are and how the patio ties it all together. The best part however, is that both projects started and ended on time. They were here everyday by 8AM and worked a full day. There were none of the horror stories you usually hear about contractors not showing up for days at a time. It is a truly professional operation. The Gappsi group installed a custom freeform pool in my yard. They listened to my wishes and went out of their way to construct exactly what I had envisioned. They were professional and took the time to provide the highest quality install. Even the owner Giuseppe personally took an interest in my project and went above and beyond to ensure our happiness. The Gappsi group made a large project an enjoyable and stress free experience. Gappsi’s work on our backyard was incredible. We could not be happier. We have a relatively small property and Gappsi put together a design that made the most of it. We found the crews to be extremely knowledgeable about the details of the project. They were professional, hard working and diligent. The pool is absolutely gorgeous and of the highest of quality. The masonry work came out amazing. Giuseppe was extremely responsive to any calls and questions we had during the entire process. He took the time to explain things and go through our options. He was open and up front through all phases of the project, which we really appreciated. We certainly look forward to having Gappsi do much more work for us in the future. We had Gappsi design a beautiful Gunite pool surrounded by a large Travertine patio, pavilion with outdoor kitchen and we are thrilled with the results. It really looks like Heaven. Anytime we were unsure about anything, all the suggestions that Gappsi made turned out perfectly for us. We are planning another project for our front yard and we are going with Gappsi without any concerns since we are already so excited about our amazing dream backyard! In 2012, we met with several companies to design and construct our backyard patio & kitchen and pool surround before deciding to go with GAPPSI. We could not be happier with our decision. The staff at GAPPSI patiently worked with us to develop a detailed computer generated design that incorporated all of our ideas and wishes. While trying to decide on the type of stone work to be used for our project, Giuseppe Abbrancati, the founder of GAPPSI, personally took the time to work with and guide us to a combination of natural material that looks incredible. The construction crew was a talented, hard working and friendly bunch, who clearly took pride in producing high quality results. The finished project exactly matched our design and surpassed all of our expectations in quality and beauty. Our backyard was transformed from plain to just plain stunning! We get raves from all who come to visit. It should also be mentioned that GAPPSI stands behind their work. Three years after the job was completed, we had an issue that needed to be addressed. Giuseppe took the time to come over and assess the problem and then had his crew correct it, free of charge. I highly recommend GAPPSI to anyone looking to beautify their home with a company that prides themselves on paying personal attention to the customer, producing high quality results and standing behind their work. We hired Gappsi to design and install our in-ground pool in 2015. Although we thought we knew exactly what we wanted, Giuseppe advised us based on our goals & property size, and I’m glad we followed his suggestions. We also went with his recommendation on the placement of the pool in the yard, the size & shape of the patio, and leveling of the property. Gappsi built the pool walls with reinforced poured concrete instead of steel. I can only say good things about the whole experience I had with the company and Giuseppe in particular. I have finished my pool construction in the middle of fall and for the same reason I couldn’t use it that year. They closed the pool last year and came back this year early and opened the pool did the cleaning, shock and the whole nine yard. The pool looks amazing and I will absolutely recommend them for anyone who wants to build a pool in your backyard. They are very professional and knowledgeable. Love their workmanship. Very good experience. From first contact to the finish of our project Giuseppe and his team were a pleasure to deal with. They worked with us to alter original plans when expensive health issues derailed what we had hoped to do. They found a way to replace our retaining walls and steps that we could afford. Even now, months later, I have been contacted to make sure we are happy with the work that was done. Very professional. Very skilled. Very friendly. Very very happy! We looked around and compared more than three different well known companies to install a pool and patio in our resident. The main focus was on getting a high quality work at a reasonable cost with company that has very good reputation and will be around for long time, in the event of issues arise after work is complete, which we consider is very important. Gappsi was the company that we decided on to offer to do the work. as a detailed person, it is important to me to know every step in the way and why it is being done that way. something that annoy any contractor, Giuseppe and his team were super patience with me, had answer every question I had, and made some changes to accommodate my requests and not being annoyed which is something not easy to find these days, which resulted in a very nice pool and patio that kids and family are enjoying every day with no issues that has arise after the work is complete within the anticipated cost. I very highly recommend Gappsi as a company of choice to do pool and patio work. We chose Gappsi to design and install our patio and have been 100% satisfied. Giuseppe puts his heart into his work, and has the expert experience of generations before him. The few times we called to have a loose stone replaced here or there (after a harsh winter), he was at our home immediately to take care of whatever needed to be done. Standing behind one’s product over time is hard to find these days, but Gappsi delivers and has so much pride in providing excellent work and keeping his customers happy. I would recommend Gappsi to everyone! MY wife and I interview many home improvement companies. We enthusiastically went with the Gappsi group and we are so happy that we chose wisely. The professional manner, level of quality and reliability was beyond our expectations. They actually provided the services promised and on a timely basis. That was quite refreshing indeed. We had a major modernization of our kitchen, a bathroom, outdoor patio and swimming pool renovation. Their staff were courteous, knowledgeable and dependable. This includes the carpenters, electricians, tile men, stone masons etc. Mr. Giuseppe Abbrancati is a “hands on” owner who oversees all projects. He cares that the work preformed is of quality and to his customers requirements and satisfaction. We give our full endorsement and recommendation to The Gappsi group of home improvement professionals. My wife and I choose Gappsi to transform the landscape, entrance, driveway, and stairs leading to our home some years ago. We were more than pleased with the outcome, the finished product was magnificent. This past winter was not only harsh to the population of Long Island it was harsh on its infrastructure as well. Because of the many cycles of freeze and thaw streets, sidewalks and paved areas were affected with damage. The cap stones of my stoop were not an exception. I had contacted Giuseppi and informed him of the damage. Even though this work was completed some years ago he personally followed through to spend two days rectifying the damage and replacement of ALL the capstones to match in color. He stands behind his work and reputation in that he also absorbed the cost of his crew in its two day effort to please his customer. . I would also recommend Gappsi as reputable and their finished work is impressive. Gappsi masonry did an amazing job installing the Travertine stone we chose called Fiorito that Gappsi himself imports. It’s truly a beautiful stone and unlike anything else we has seen on the island. The crew operated very professionally. They always showed up when they were supposed to, worked hard all day, and cleaned up at the end of the job. Ask to speak with Giuseppe the owner. He was very helpful and accommodating throughout the whole process. I would definitely recommend this company to a friend. It’s all too often that contractors take the money and run. Gappsi Inc. did a lot of work on our property. One of the projects that they completed did not work out as expected. Rather than denying wrong doing or us having to go the legal route, the owner, Giuseppe Abbrancati, personally came to our house, assessed the issue and fixed the issue. We had a major water drainage issue at the bottom of our retaining wall. Originally, Gappsi put in a dry well and piped into it. The issue of water being trapped inside of the retaining wall still remained. Gappsi dug out the vicinity, re-piped the connection with better material into the dry well and lay down large gravel to allow the retaining wall to drain and water to dissipate into the new pipe and ground. While it’s only been several days, it has rained and thus far the major water issue that was happening has not reoccurred. I contracted Gappsi several years ago to construct a rather large patio with pavers, in addition to this I had them do my driveway and walkways. Prior to having the job done Giuseppe spent a good portion of a day explaining to my wife and I, the entire process, the various type of pavers available up to and including touring several jobs that he done in the area. His crew provided quality work from start to finish, he was accommodating through out the process making this one of the best home improvement experiences we’ve ever had. Now several years after the job was done I contacted Giuseppe because some portions of the area were starting to sink, he had told me I had a lifetime guarantee and he honored it to the fullest, he came to inspect the area and had a crew make the repairs. I have and will continue to recommend Gappsi to family and friends because they are a company whose values include honesty, integrity, customer commitment and respect for the individual. After super storm Sandy our backyard was left pummeled by our neighbors trees. Our in-ground pool took the brunt of it. It was old with plenty of outdated features. We had lots of questions, repair or upgrade ? We met with Giuseppe and he gave us an honest assessment of our situation. We did the research and everything he told us was true and it didn’t make sense to repair, upgrading was actually cost effective. After upgrading the equipment portion came the stone work around the pool. The masonry team that did that work was wonderful. They had challenges but they were skilled, talented, and they transformed the pool area into an oasis. The trees had also damaged our deck. We had to wait a year but when the time was right and without hesitation we called Gappsi. They understood that we were trying to stay within a budget and once again gave excellent design ideas that complimented the work that was done a year earlier. The deck came out beautiful. Those pesky trees also damaged the fence and coincidently Gappsi has fence guys. If I write how wonderful they are you will begin to wonder if this is a legitimate review- I assure you this is. The fence guys also do the stone sealing. If you go to the showroom they have a great display, words cannot describe how this sealant enhances the natural stone color. Once you see it you want to have it done and Gappsi has an excellent team who will do this. I cannot say enough about the teams they employ, hardworking, courteous, professional, no shenanigans. They say that quality doesn’t cost, it pays, I felt the work that was done was reasonably priced – so – given the quality of their work, dealing with Gappsi is not only a pleasure but an excellent VALUE ! I recently hired Gappsi to re-do my driveway and walkway with all pavers. Giuseppe and staff were outstanding to work with. They went above and beyond to design a gorgeous layout and helped me pick out beautiful stones and colors. They are reliable, on time and their quality of materials is excellent. Their top priority is to make you the customer happy. I couldn’t be more happier with my driveway and walkway. I would also very highly recommend using Gappsi to seal your pavers. It really brings out the colors in the stone. My only regret is that I didn’t do my driveway years ago!! Im also looking forward to my next project with Gappsi…my backyard!! If you are looking for excellent quality work Gappsi is definitely the company to use!! Gappsi finished installing our paver driveway a week before Sandy hit in Oct-2012 (Jeff supervised the job). Despite damage to our house, the driveway survived without issues. Last week we had Gappsi clean and seal the driveway to preserve it for the future. Jeff and Dave did a wonderful job of cleaning a rust stain (from the steel basketball net dripping onto the pavers), leaf stains near our front door, and they even removed any weed that was growing in the tiny seems between pavers. They could not apply the poly-sand and sealer after the cleaning because rain was forecast. Instead they showed up on Sunday (along with Giuseppe, one of the owners) to complete the job. It looks beautiful and we are very happy with the quality of Gappsi products and their people. Gappsi installed a replacement liner for our 20 year-old pool in 2013. This year (2015) we noticed a few spots where it pulled away from the coping. We called to ask them to take a look. Giuseppe arrived on the day and within 5 minutes of the time he said. He saw the problem areas and fixed them on the spot. ‘Can’t ask for more than that. 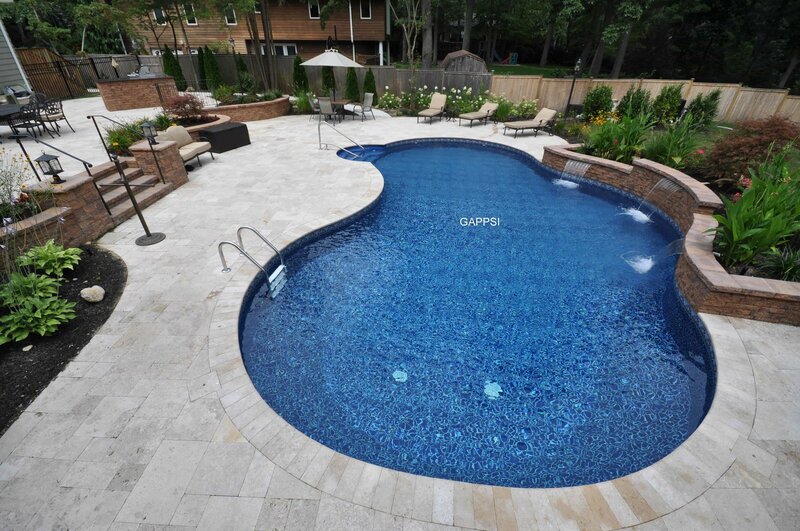 Gappsi Giuseppe Abbrancati Smithtown- love the Travertine and work they did for us around the pool a couple years ago ( can’t believe its been that long already!) Professional, reliable, highly recommend. We really assumed it’d be way too expensive to have such a beautiful stone-but youd be surprised! doesn’t get hot and is so so pretty! Thank you! I know that I have been remiss in writing this note and after a year living with the patio, driveway and pool upgrade, I could not be happier. Thank You and your Team (Pete and Kevin) for a wonderful renovation. A few years ago, we started the process of looking for a contractor who could install a new natural stone patio. We were also looking for someone to refurbish our aging gunite pool. The thought of having to coordinate the installation of the patio at the same time having a different contractor upgrade the pool was a troublesome concept. Myself or my wife could not devote the time needed to oversee the work much less manage competing project deliverables. The moment we visited the Gappsi showroom in Smithtown, we were impressed with the “living showroom” that we experienced. Each parking spot highlighted a different grouping of available stones. Even the walkway leading to the interior showroom depicted various natural stones of every shape, size imaginable. Giuseppe, with his easy going manner, made us comfortable and laid out the “art of the possible” for our patio renovation. He also introduced us to Kevin who showed us what was possible and feasible with our gunite pool renovation. The entire project could be done with one vendor who clearly demonstrated expertise in each of the areas we wanted redone. From the time, we broke ground to the final walkthrough, Peter, the project manager oversaw every detail and coordinated all aspect of construction. Guiseppe and his team were able to manage my expectations, frustrations and anxieties. None the less, the work was completed on time and I can honestly say that I love the renovation more today than I did when it was first competed. We hired Gappsi to put in a new backyard patio and we could not be any happier. Giuseppe, his company and his workers are true professionals. From day one, there was a relaxed, no pressure atmosphere. Different options were given and he would give his honest opinion on my thoughts. When the workers came to my house to complete the project, they were on time, extremely neat and took the time to make sure everything was completed above and beyond my expectations. Mario and his crew were also very courteous, answered all questions and left my house in spotless condition with a beautiful new patio. I highly recommend Gappsi and will bring them back for my next project. I must say it took me years before I decided to do my driveway, walkway & patio in my backyard. I hired Gappsi Co. for this work & I tell you from the beginning to the end with all the questions I had, Giuseppe (owner) explain everything step by step making it very easy for me to understand all the details. Giuseppe & his crew was very professional, courtesy, punctual, & did excellent work. I cannot express enough how beautiful my driveway, patio & walkway looks. I would definitely recommended his co & must say again the work is beautiful. Thank you Giuseppe!! I have used Gappsi for several home improvement projects. They had done exceptional work on each project. They have done the paving stones around my pool, put on a new roof on my house and redone the chimney and stucco work around the house. On each project, they have been professional, worked efficiently and completed the work on time and at the agreed upon price. I would highly recommend Gappsi for all home improvement projects. Giuseppe and his crew are professionals. I had beautiful travertine stone and landscaping done in my yard. Giuseppe and his team were easy to work with from design to final product. The end result is beautiful. When I had questions or needed something Guiseppe was responsive and worked hard to service his customer. I would highly recommend Gappsi and will definitely be using them in the future. We would like to thank Giuseppe and his crew for a job well done at our family home. We were thrilled to find a local business with professionalism and care. The front porch, path, back patio and pool area were done in a gorgeous natural stone that compliments our home beautifully. It is truly resort-like. We are looking forward to the spring in summer this year and years to come in our outdoor oasis. Front & Back Pavers, MAGNIFICENT! There is no other company that I would recommend other than Gappsi. Words cannot express how happy I am with the end results. Gappsi redid my pavers for the front and back of my property. I have people ask me on a daily basis as to what company I used. I am constantly referring Gappsi to friends and strangers that approach me. Their work is out-of-this-world, The owner (Guiseppe) is the kindest man, and every employee is a hard worker. My house looks beautiful, and I will certaintly be using them again for future projects! Thanks Gappsi! You are a LIFE SAVER! We needed a walkway redone, not a huge job. Not only was Gappsi reasonably priced, but they are professional and did a wonderful job. Very satisfied, and happy to know that Gappsi has donated work in several of the Smithtown schools! Giuseppe of Gappsi did all of our brickwork around our pool, two patios, steps and front walkway 16 years ago!!. His work was not only beautiful but in all the 16 years we never had a problem. This summer, we noticed a loose brick in the corner of one of the steps and a few bricks on the front walkway started to sink, not due to workmanship, but rather water damage caused by a draining gutter. We called Gappsi over the summer, and while it took awhile to get back to us, Giuseppe called back himself. He remembered us and the house. He came out to the house the day we spoke. A few days later his crew was at the house and the bricks were fixed! I still can’t believe that after 16 years he stood by his work. I don’t know anyone in business today that is as honorable and committed than Giuseppe. Thank you Giuseppe. You have built a wonderful company. Gappsi provided excellent craftsmanship and exceptional courtesy. Jeffrey and his assistant were extremely neat and efficient. They were also very polite and accommodating. We have used Gappsi before and will use them again! Gappsi re-designed my backyard pool area and installed pavers about 9 years ago. Still in great shape. Excellent workman’s ship. Giuseppe Abbrancati and his company GAPPSI have done masonry work for us over the years. He installed a 50×20 patio, 2 walkways and 2 stoops. The finished work is beautiful! In addition, they have installed a batting cage and sealed the beautiful masonry work they previously installed. Giuseppe is a true professional who delivered on his promises. My wife and I are very happy with how he has enhanced the beauty of our home. As you journey through life you find that there are very few people you can trust. I trust Giuseppe as if he were my brother and we highly recommend GAPPSI. The transformation of my home was amazing. We went from boring front steps, walkway and driveway to a beautiful and welcoming combination of a granite pavers driveway, and granite steps with marble inlays to our front door. It is a beautiful beautiful experience to arrive home to each day, and we couldn’t be happier! In 2010 we had a masonry job completed by Gappsi the new design and stone work came out great (we get compliments all the time)! Over the years, some of the stone work needed to be leveled and some weathered stones needed to be replaced. Within a week of contacting Gappsi, they came and took care of the minor repairs at no cost. Gappsi is a great company and takes good care of their customers. Thank you! They came and cleaned up and re did my stone stairs in front of my house. It has made such a difference. They were professional and people who have not been to my house in months say “the stairs look gorgeous what did you do.” It was worth every penny. Great service and reasonable prices. Honest guys. Working with them for 8 years now. Gappsi power washed and sealed my patio and front walkway. I couldn’t be happier with the end result. Both look brand new…actually they look better then when they were first installed. Great work Gappsi!!! Jeff met me at my home at a convenient time, and went over in detail what the company would do as far as the artificial turf on my front lawn was concerned. He then promptly e-mailed the proposal. This company seems reliable. I have been honored to work with Gappsi for the past 2 years. They are very meticulous with detail and their projects come out absolutely amazing and breathtaking. I come at it from a different standpoint, I get the permits for their work but I can honestly say….. I have worked with numerous different contractors, architects, and design companies in the industry. Never have I ever, had clients that put some much trust in to the contractors word that Giuseppe’s client’s do, and in this business, that says something for a company. Most people don’t trust their contractor, or think they are gonna get screwed over one way or another, but I have never had gotten that feeling working with any of their clients. Working with Gappsi truly makes my part of the project worthy and pleasurable. It is an honor to work with such a great company and such a great guy, Giuseppe. As it would be an honor to park in a Gappsi designed driveway. Had a great experience with “Jeff” and his crew. They were professionals the whole way . I can not say enough , about them. They restored my patio, and I could not be happier!! First class service the whole way! I had my driveway, stone retaining wall and paver patio powerwashed. The poly sand was vibrated into the joints and sealed. Jeff and his “very professional” crew did an exceptional job, leaving my stonework looking better than when it was new. Jeff made sure I was more than happy with the final result. Gappsi did a great job refinishing our pool. It looks brand new! They also provide great service. I highly recommend the Gappsi team for all your pool needs! The crew cleaned and sealed my patio. Outstanding job. The patio is better than new. The sealant protects the stone and looks amazing. Jeff (Gappsi inc. ) and his crew were very professional, efficient and their work was great. They exceeded my expectations in every way. They were on time and the job was completed with no problems. The driveway and all retaining walls looks great. Thank you Jeff ( Gappsi inc. ) and your crew for completing a great job! I highly recommend them for all your paving needs . Quality, Fast, and good price. Appreciate Gappsi’s attention to detail and making sure I was completely satisfied before the was job done. Thanks Greg, Emanuel’s, Danny & crew! I am so very grateful to Jeff and the Gappsi team. Jeff was amazing, professional, and honest. We had our pavers power washed, repaired, sanded, and sealed. They also power washed the driveway, sidewalk, and fence. The team was meticulous and extremely hard working. The work they did was so impressive that all of my neighbors came over to comment and compliment the work. I would highly recommend Jeff- the Gappsi team. They are the best! Thank you Jeff!!! I called Gappsi to have the travertine pavers around my pool cleaned and sealed and I was glad I did. The crew was at my house and explained the complete process to me. They were meticulous with every detail and even replaced two tiles that were cracked. They did an unbelievable job and we couldn’t be happier. Great job guys!!! It was a huge project and it was done in a super fast. From day one true the whole contraction time everything was done in a clean and professional way. The Gappsi team is second to none! We had a backyard that was in desperate need of a patio, stoops, and for good measure, let’s add a hot tub! From concept to completion, Guiseppe and the great team he employs took care and concern about each phase, listened to my concerns and made the requested adjustments accordingly, and finished the project on time and on budget, which is not something you can say about other companies out there…and it looks amazing! Just to show you how great the company is, here is a quick story – we all recall the record rain storm that hit LI pretty hard back on August 12-13, 2014; this storm hit the Islip area particularly hard; the recent patio and soon to follow, yet not completed, landscaping creating a situation where the water pooled up surrounding/slightly submerging the new hot tub; this was no fault of anyone’s but mother natures!…needless to say, I was besides myself with having to deal with the situation and the potential for the new tub to be ruined…I called Guiseppe for advice and assistance to assess and mitigate the situation; he and his team responded immediately and came and lifted the tub, built a completely new raised/elevated stone platform, created a drainage ditch to surround the tub, and built additional retaining wall to re-direct and stop water from flowing to this area in the future. Also, he dispatched their bit tub technician to look and see what, if any long-term damage may affect the hot tub – I am glad to report all is well and there are no issues with anything. The point is that, Guiseppe and the GAPPSI team stand behind their work 200% and will do what it takes to make sure that you are satisfied as a consumer; there are other companies out there that do this type of work on Long Island, but I would not look anywhere else but to GAPPSI when the time comes to build a patio, sauna, driveway, custom landscaping, and all of the other home improvement services they offer. We are soon to embark on a fence and driveway project and Gappsi has quoted us for both and we are going to contract their services for these items as well. Trust me…you won’t regret going with GAPPSI…but as always, and educated consumer is the best customer…do you homework, research, ask questions, understand the variables, etc. I have found that when issues arise, it’s usually due to the customers lack of understanding and self-education, and often unrealistic expectations. Outstanding service… professional in all aspects… highly recommend Gappsi!! Gappsi did an amazing job on our deck! It looks gorgeous, was done quickly, and Giuseppe was available for any questions we had. We will use them again for other projects, and highly recommend them to family and friends! Had a great experience dealing with Guiseppe.he had great ideas I ended up with a fire pit at giant staircase with a multi level patio seven years ago it was done and it still looks just as good today as it did the day It went in and he stands by his work.I would highly recommend gappsi. I had my paver driveway installed about 13 years ago and had no issues. I left the design to Giuseppe and we couldn’t be happier. I just had them back to power wash and seal it and once again they did a great job. I would highly recommend Giuseppe and his crew. Did a great job helping me come up with a concept for the front patio for my condo, and the crew who came to put it all together did beautiful work front to finish. Would highly recommend for masonry work. After fielding more than 5 bids for my pool/patio project I went with Gappsi. To do our major patio remodel. They were able to meet and exceed our every request and beat the price of all of the competing bids. Our project was completed later than expected but that’s because of delays with the company reconstructing our pool. They work long hours and sometimes even 7 day weeks to get your job done the right way. They are also very responsive to any questions and accessible with any issues after completion. The travertine they use can’t be found at many other places and really takes a project to the next level. We will definitely be using them for future projects. All work as agreed was completed timely. The work included many repairs from another company(s) who perform poor quality work. Uneven sinking front walkway pavers removed and releveled. Sinking pavers on back patio were removed and releveled. Stoop installed by previous company completely removed due to inferior install was collapsing and not to code. Gappsi explained in detail what was incorrect and not to “code” and how it was going to be designed to fulfill code requirements. Gappsi crew were very professional and meticulous with their workmanship. I highly recommend this company and don’t make my mistake by hiring non-professional companies without a written contract detailing plans. Have had multiple jobs done over the years including brick work and redo of pool lining and stairs. Recently had some bricks that had shifted and can always count on giuseppe to stand behind his work. Jeff and his team – jose and willy came and did the repairs for no cost and i did have the team apply the sealer to the brick work. They were super professional, meticulous, reliable and the job is absolutely awesome. You guys are a class act!! Congratulations on a job well done! Your 911 memorial at the Commack HS truly encompasses who you are, and shows your dedication to our surrounding communities! If I have a project coming up, you will be the first to know! You are masters at what you do!! Jeff was wonderful and made sure everything was on track he is personal and professional. Willie was awesome he worked very hard to give me a great before and after product. GAPPSI is the best in the business!!! Very reliable and does an amazing job. His crew is amazing too ! Highly recommend! Great workmanship renovating my mom’s bathroom, and appreciated it all the help with picking out supplies for the project since we are not local. Also appreciated the follow through with some back-end issues. Gappsi did a terrific job cleaning and sealing my patio. I highly recommend them. The owner came to the house and explained different options. We choose another option and he recommended someone else for the job, who called the next day. Great teamwork and customer service. Would highly recommend Gappsi! My granite walkway is absolutely beautiful! They do excellent work, very professional, fare price too!! Excellent experience. Very nice company and quality product /install. Very competitive pricing. Excellent service and very easy to deal with. Gappsi has done several projects for me including backyard patio and driveway. Always reliable and professional. I would highly recommend them. Simply excellent. Gappsi did my pool liner, lights in pool and brickwork. They were on time, efficient, responsive to my calls and priced fairly. Job well done. Outstanding company! Professional, prompt and beautiful job on the stone on our house.Would happily refer them to anyone needing their services! Thank you! They did a fantastic job on a natural stone patio with a fire pit and built in barbecue. Greg was instrumental from the beginning, he helped design the layout that worked for my backyard. He was there every step of the way from estimate to completion of job . There were no surprises along the way, the crew was there when they said they would be there and completed on time. Greg also set me up with a marble guy to find a top for my BBQ. (Big savings) they go the extra mile .Outstanding masonry work! I am very surprised that in a field that is seasonal so many people who work in masonry either do not show up for appointments or never bother to provide an estimate. This was not the case with Gappsi. From first contact to project completion this company was professional, courteous and easy to deal with. Very happy with the work they did for us and will use them again! Gappsi masonry did an amazing job installing the Travertine stone we chose called Fiorito, which the owner of Gappsi imports himself, for our back yard patio pool area. It’s truly a beautiful stone and unlike anything else we has seen on the island. The crew operated very professionally. They always showed up when they were supposed to, worked hard all day, and cleaned up at the end of the job. Needless to say, we are extremely happy with the workmanship and the stone. It all exceeded our expectations. We have already been getting many compliments about how great the stone looks and how the masons did such a great job. Ask to speak with Giuseppe the owner. He was very helpful and accommodating throughout the whole process. I highly recommend this company to everyone. I had my backyard done with travertine Oct 2013 and Gappsi did a very professional job. The crew they sent out was extremely meticulous and we could not be happier with the results. This past winter was extremely cold and in some areas we experienced some settling and what I’ll call normal shifting of some of the stones. Gappsi warranties the job for 3 years and when I called to have them repair the issues Giuseppe sent a crew the next day. I must be perfectly honest I did not think they were going to come back and fix the issues after 2.5 years, but I was pleasantly surprised with the responsiveness and excellent service to fix each and every stone that settled. I highly recommend Gappsi if you are looking for quality and reliability. My pool deck and patio were completely renovated with new stonework by Giuseppe in 2009. Actually the pool was just about re-built. The entire crew were professional and hard working. The completed job was terrific. I continually receive compliments about the work and how well it looks. This past harsh winter had some of the stones lifting up. I called Giuseppe and he explained that this was normal but if the stones did not resume their proper position to call him. I was not pleased with the stones and Giuseppe, true to his word, came out to my house and arranged for his workers to come and fix the stones. He even had his crew fix stones that I didn’t even mention to him. I would certainly not hesitate to do business with Giuseppe again. After all, who continues to stand by their products and work even after six tears. From the beginning of the competitive bidding process, Giuseppe was responsive to our needs and with his knowledge and experience in the field gave us the immediate feeling that he really knew what would be the best solution to our project. When it came time to select a contractor, Gappsi’s price was the best of four bids received and offered the best value solution to the Community entry walls that were built. The entire construction process was handled in a very professional and timely manner. The Gappsi team was most cooperative and responsive to our requirements. Had my paving stone drrveway and pool deck cleaned and sealed by Gappsi. They have the right equipment products and people to do a thorougho job: Scrub & Clean, regrout joints, apply a quality sealer. Selvin & rRberto did a fantastic job without fuss or bother. They took care of everything from start to finish. The job took 2 days and it looks great. If you need a cleaning on whatever your hardscape mught be, I suggest you give Gappsi a call. The Gappsi team is terrific. They refinished our pool and it looks amazing. Their service is equally as good. They take care of the pool as if it were their own. I highly recommend their services. Enjoying the beautiful work by Gappsi pools on this Georgeous Sept day, three years after install of 16′ x 30′ inground pool, (with auto cover) three tiered pavered patio, massive boulder walls around perimeter of property front and back and massive front portch! Excellent work admired by all our friends and neighbors and a great investment!, Thank you Giuseppe!!! My Gappsi Paver driveway is 12 yrs. Old and has held up beautifully. Needed a good cleaning so Jeff and his “very professioal” crew came in and powerwashed, poly sanded, vibrated and sealed it, plus a patio and retaining wall. Everything looks better than new. The crew went out of there way to make sure I was more than happy with the final results. They’ll be back when it’s time for a clean and reseal. Giuseppe is a man of his word. Hard working dedicated individual. Used Gappsi for multiple projects. Jeff did a great job on power washing, sanding and sealing our pavers. He is a pleasure to work with and the crew left the yard spotless. Jeffrey from Gappsi came after I saw their youtube video on sealing a driveway. My wife and I were overly impressed by their meticulous work ethics. They did such a great job that my neighbor across the street asked them to do their driveway as well. Jeffrey and his guys are fantastic and explain everything that they do. They will definitely seal my backyard in the spring. We can’t begin to tell you how much We love our new driveway and the sealing they did . After calling numerous people and shopping around I met Giuseppe. I knew right away I was in great hands .The quality of work they do is unbelievable . His associates are true professionals . Thank you for everything . Just powered up our amazing spa from Gappsi, it’s awesome! Thank you so much Giuseppe, it’s absolutely 110% better than expected! I would like to thank the Gappsi Company for the work they recently provided at Great Hollow Middle School. My interactions with Giuseppe and his team were excellent as was the quality of the product that they produced. I am thankful for their contributions to our beautification efforts and I look forward to working with them again in the spring. FANTASTIC. Gappsi recently completed our hardscape around our pool (replaced our pool coping w/ granite, installed travertine pavers, added walkways and built a retaining wall). We are absolutely delighted with the results. It was a pleasure working with Giuseppe and his crew. They were very professional, knowledgeable and honest. We were extremely impressed with their quality of work and attention to detail. We recommend them highly and plan to use them again next year for another project. When I moved into my current home almost 10 years ago my long driveway consisted of dirt. My options were to have blacktop, or concrete. That is until I saw paving stones. After calling several contractors I decided on Gappsi. Giuseppe had the greatest ideas as to how the finished product would look.The working crew was professional,courteous and well trained by Giuseppe. The job took about a week but when complete I could not believe the finished look, it was just beautiful.Many people that either walked or drove by my house stopped and admired my driveway and stoop. I could not have been happier.As far as I’m concerned Gappsi is number 1 in the business and I would not hesitate to recommend him to anyone. After interviewing several swimming pool contractors we selected Gappsi to install our swimming pool. Right from the begining Giuseppe and his staff were very knowledgeable and helpful. Giuseppe was involved right from the beginning and stayed with the project until the end. The pool was constructed in a very tight area and was completed without and issues at all. To my amazement Gappsi completed the pool construction in under a month. Gappsi also installed the Travertine bluenose coping around the pool perimeter that looks great and very comfortable on your feet. At the end of the season they promply showed up and closed the pool and installed the Loop Lock cover agian all the Gappsi staff were very profesional and knolageable. If you are considering installing a inground swimming pool Gappsi is definatly the way to go! Great Job All Around. I can’t say enough positive things about Giuseppe and his staff. I had gotten several estimates for a pool surround, walkway, and stairs before going to Gappsi. After choosing a company to do the work, a neighbor had recommended Gappsi. My husband insisted we get an estimate from Gappsi before we finalize anything. After going to Gappsi and meeting with Giuseppe, I was so excited and started thinking how I was going to tell that other contractor I wasn’t using him after all! All my other estimates had been for Cambridge paving stones, which at the time, is what I thought I wanted. Giuseppe introduced my husband and I to travertine, and at first we weren’t interested. We insisted we knew what we wanted and we weren’t changing a thing, we just wanted an estimate. I thought his estimate would probably be higher than all my others and then I can just go home and proceed with the other company. But what a mistake that would of been ! We went with the travertine after all and that was … I can’t say enough positive things about Giuseppe and his staff. I had gotten several estimates for a pool surround, walkway, and stairs before going to Gappsi. After choosing a company to do the work, a neighbor had recommended Gappsi. My husband insisted we get an estimate from Gappsi before we finalize anything. After going to Gappsi and meeting with Giuseppe, I was so excited and started thinking how I was going to tell that other contractor I wasn’t using him after all! All my other estimates had been for Cambridge paving stones, which at the time, is what I thought I wanted. Giuseppe introduced my husband and I to travertine, and at first we weren’t interested. We insisted we knew what we wanted and we weren’t changing a thing, we just wanted an estimate. I thought his estimate would probably be higher than all my others and then I can just go home and proceed with the other company. But what a mistake that would of been ! We went with the travertine after all and that was the best decision we made. And although travertine costs more per sq. ft. than the pavers, Gappsi’s estimate was lower than all the previous estimates! Everybody at Gappsi is professional, polite and very accommodating. I wanted something changed after it was completed and they ripped it up and did it again, no problem. They added a retainer wall at no additional cost when they realized that it was needed and not figured into the original estimate. I chose individual stones to be placed in specific places and they did it, never complaining or acting annoyed with me at all. They truly are the nicest people I have ever had at my house. I liked them so much that I ordered my Loop- Loc cover from them, which their pool division installed. And their pool division opens and closes my pool each year. I strongly recommend Gappsi, you will be very pleased, there is no better. Great Backyard Patio Kathy and I are delighted with the new granite patio that Gappsi installed in less than two days. Their crew was very professional and courteous. The armagansett beige granite outlined by travertine matches our kitchen marble tile creating a continuous look from inside the house out to the back yard. It is amazing that three trucks, a fork lift, and many pallets of stone came and were installed is such a short time with no damage done to our lawn and perfect clean up. We are proud to show off our patio to our friends or anyone lookingto use Gappsi for their landscaping project. Giusepee had done my sister’s patio, about 10 years ago, so when I was looking for a contractor for my own project I called him. Mike and Giusepee arrived and we went over the project details. Based on their questions to my wife and I, immediately I felt that they were not only professional and knowledgeable but also trustworthy. This was extremely important to me after hearing so many bad stories about various contractors. I was expecting a higher price than the others I had interviewed, (after all you get what you pay for), but that was not the case. Gappsi’s price was the lowest. There was so many styles and choices of stone, my wife and I were overhelmed, so we gave a few ideas to Giuseppe and told him to figure it out. Mike and his crew arrived each morning by 8am and worked all day. More than one neighbor commented to me “boy those guys are really working hard!” When they were finished, it was better than I could have hoped for. Driveway, Stoop, steps, walkway and a large … Giusepee had done my sister’s patio, about 10 years ago, so when I was looking for a contractor for my own project I called him. Giusepee arrived and we went over the project details. Based on his questions to my wife and I, immediately I felt that they were not only professional and knowledgeable but also trustworthy. This was extremely important to me after hearing so many bad stories about various contractors. I was expecting a higher price than the others I had interviewed, (after all you get what you pay for), but that was not the case. Gappsi’s price was the lowest. There was so many styles and choices of stone, my wife and I were overhelmed, so we gave a few ideas to Giuseppe and told him to figure it out. his crew arrived each morning by 8am and worked all day. More than one neighbor commented to me “boy those guys are really working hard!” When they were finished, it was better than I could have hoped for. Driveway, Stoop, steps, walkway and a large patio were all spectacular and we were very happy. I recently hired another contractor to replace my windows. As I greeted him at the front door, he said to me, “Gappsi did your driveway and steps” I said yes”how did you know?” He replied that matching capstones was a trait, he had seen in many of Gappsi’s projects and that they do nice work. I said I know. Personally, I think it would be a mistake to consider a project like this and not even call Gappsi for an estimate. Professional Job: We used Gappsi to install our swimming pool patio 10 years ago and the job was constructed with a 3 feet high retaining wall around the entire pool area. The swimming pool was sunk down in to the ground and a drainage system needed to be installed. Giuseppe suggested to install (4) drywells – one in each corner- and had the patio slope towards the drains. Gappsi used rustico 6×9 bayberry blend Nicolock for the pool patio and the same paving stones for the driveway, front steps and front walkway. The job was professionally completed in a timely manner as promised. The installation and workmanship had been outstanding and every thing worked well for the past 10 years. We used Gappsi again this year to install asphalt driveway with tumbled paving stone borders at our office building in Massapequa. As expected, we’re very pleased with the work done. We had recommended Gappsi for our friends and relatives and they all appreciated his work. My experience with GAPPSI over the years has been unbelievable. The product is amazing as is the installation but more importantly the customer service is second to none. GAPPSI installed my patio and walkway with Nicolock tumbled village paver’s adobe blend, about 10 years ago and I will certainly call upon them for future projects. My husband and I purchased a new home that needed a new kitchen. My fears were having my kitchen turned upside down and waiting months to have a workable kitchen for my family. We decided on using Chris Galvin at Gappsi Construction and that was the best desicion we made. We received the highest quality of craftsmenship, professionalism and ontime service. I have always heard about how difficult and challenging having a kitchen done can be. I am happy to say our experience was the complete opposite of that. My kitchen is amazing and I love to entertain my guests. Thank you for your creativity. Gappsi is a great company to workwith. Very professional and friendly. We gave Giuseppe an idea of what we wanted and he designed a beautiful patio! The work was done very timely and the team was extremely knowledgeable and neat!!! Giuseppe also came back and did an additional stoop. The price was very reasonable and the work was impeccable! Thank you Gappsi!!!! Gappsi was recommended to us by a friend that also had their swimming pool installed by Gappsi. We had a 16×34 swimming pool built in our back yard, completed with moca travertine in a French pattern around the pool and 6×12 travertine for the walkway from the driveway to the back yard. We decided to install an automated swimming pool cover for the pool after it was explained to us about all the benefits. We are very happy with the results and look forward to years of fun with our pool! Dear Giuseppe Just wanted to send you a quick note to let you know how thankful we are for the INCREDIBLE job you and your team have done for us! We originally thought we would just be installing a new patio but after meeting with your team, we quickly decided on a complete pool, landscape and hardscape renovation. Our renovation was completed late July 2010. I wanted to write you much earlier than this but am glad I waited. As you know, we were very hesitant to install travertine even though we liked it very much. We were afraid of it not enduring the elements of living in the North East. After a brutal, snowy winter and a very rainy spring, we are extremely thrilled with the stone, and the fact that it looks exactly the way it did when it was first installed! The crew who did our hardscape installation was EXCELLENT, their craftsmanship and attention to detail was truly reflected in the end product, and we could not be more happy with the outcome! Your crews were just as EXCELLENT as everyone else we encountered throughout our Gappsi experience! One major concern of ours was the grading in our yard. Every time it rained we would literally have a “lake” throughout the yard. the crew re-graded our entire yard and we couldn’t be more pleased with the outcome. After 6 years of having our own “private”LAKE”, it is finally gone and we couldn’t be happier! Thank you again, Giuseppe! We usually don’t recommend any contractors to our friends and family, however, Gappsi will be and has already been recommended to some of our friends. And, we already have a call into Gappsi as we are planning a bathroom renovation in the near future. Thank you again for the incredible transformation. We are extremely pleased! Amazing ! A dream come true ! That’s the only way to describe the exceptional work of the gappsi organization . When we went to Guiseppe and asked him to do our front steps and landing we weren’t sure how this miracle was going to take place it was a real challenge that came out perfect. Then we did the back yard which also was challenging but not for Guiseppe ,he said don’t worry it’s going to be beautiful and it was !. .We had no idea what it was going to look like but we knew from experience that we could put our trust in him. He made a forest into a showplace !Well worth the price..
FIVE STARS! We visited Gappsi’s amazing displays and showroom on Jericho Turnpike in Commack and immediately decided our old asphalt driveway (#3!) HAD TO GO! Owner Giuseppe Abbrancati suggested some beautiful designs and patiently worked with our ideas as well! The Gappsi crew came to our front yard and magically transformed the driveway, front and side walks and front beds into a coordinated, flowing, and logical thing of beauty! Two years ago, Giuseppe and Gappsi returned, as per our request, and did the back yard walks and pool area incorporating THEM perfectly into the original design. In addition, , Giuseppe’s “pool wizard” came to straighten our pool’s sides and coping – also an EXCELLENT job! We thoroughly enjoy our landscaping today and always recommend the dependability and professionalism of Gappsi to all our friends and business associates! Gappsi has done work on my home on several occasions. I highly recommend them. the all team helped us with design ideas for our living room and kitchen. They are professional, friendly and their experience is demonstrated in their work. I will continue to use Gappsi for my future renovations. I was tired of my asphalt and cobblestone driveway, but really did not like the boring and uniform look of most new driveways and patios. I was lucky to find Giuseppe’s showroom on Jericho Turnpike. Giuseppe listened to me and turned my wishes into reality. He is a true artisan with an eye for aesthetics. He invented a unique installation technique that brings his designs to life. My selected pavers were melded from two different styles, ensuring me a unique random pattern. A trademark of his is the incorporation of curving free-form borders. He designed and installed a gently flowing driveway and patio that is admired by all who see them. Giuseppe undoubtedly exceeded my expectations. I truly consider this to be one of my best home improvement decisions. I have no doubt the value of my home increased significantly more than this project cost me. We had an idea of what my wife and I wanted and called Giuseppe, let me tell you this man knows his business. He is not only an expert on paver installation, this man can design your yard that no other can. I recommend this company without any questions, he is the man to call if you need pavers. Its been 6 years since he did my job and all is perfect. I get a joy every time i walk into my yard. his staff was always ontime and a joy to have at my home. Gappsi designed and built our back yard swimming pool and patio. and suggested the use of travertine pavers that we selected from their show room. Gappsi was professional, accommodating, and their work was top notch. I would recommend them highly. They continue to service my pool, and would not use anyone else. I searched all of Long Island, and Gappsi made my experience very enjoyable. Even with a short time frame, they go my pool installed, the patio finished, and I was swimming by July 4th. DREAM COMES TRUE! I built a deck in my backyard and wanted to compliment it with a patio. We researched options with other contractors prior to visiting the Gappsi Showroom in Smithtown. Once meeting Giuseppe our search ended. Giuseppe with his design team and 3D rendering of our backyard truly amazed my wife and I. He came up with a design that was perfect for our backyard. Travertine marble was used for the patio while Nicolock pavers and blocks were used to create a fountain and fire pit with seating. An inlaid design in the patio made it truly unique. Giuseppe’s professional and courteous crew arrived daily on time and did not leave the site until the job was completed. His attention to the foundation of the travertine pavers was very professional. The property was prepared properly to avoid problems with tree roots in the future. The finished product is absolutely beautiful and flawless. We have received many compliments on the design and workmanship. Rolando and his team are also to be complimented for their landscaping design and installation to complete the final project. Giuseppe is a fair, honest and reputable contractor that I would highly recommend to anyone considering a beautification project for their home. We needed the liner replaced for our swimming pool and we contacted Gappsi. They designed a beautiful patio around the pool and incorporated the back yard into the design. A 3d design program was used to take the project from design concept to the completion. Gappsi handled the entire project with professionalism. They replaced the pool liner, pool coping and built the patio with Fire Island Nicolock tumbled Holland stones, all the swimming pool plumbing and the also installed a loop loc cover after the installation. The patio and pool look amazing! Great Job! Pool Deck, Patio, Backyard I used GAPPSI to “rejuvenate” my backyard and pool. Giuseppe’s imagination and experience designed the perfect layout. He and his staff created a beautiful environment right outside my back door. Professionalism, Courtesy, Creativity, Workmanship, Attention to Detail….GAPPSI! Thank You Giuseppe. Amazing job! We hired Gappsi to redo our entire back yard. Giuseppe and the team came up with an incredible design, and installed a beautiful pool with an automatic cover, a great new brick paver patio, and laid down a completely new sod lawn. We were incredibly impressed with everything they did, and get tons of compliments on the quality of the work. Well worth the price to hire people who really know what they are doing, and take great pride in their work. Hi Giuseppe, My husband and I are very pleased with our experience at Gappsi. From the first phone conversation with your office, through the finished project, every step was handled in a professional manner. We were completely Wow’s by the visual presentation and surprised that the estimate fell in the mid-range of quotes we received. Throughout the project, when questions arose, Giuseppe was always responsive to my inquiries. Over the years, my husband and I have remodeled 3 homes, top to bottom, working with numerous contractors for every kind of improvement. With all this experience, I have never seen a work ethic like that of your employees. They worked all day with a short break for lunch (and occasionally, the ice cream truck!). But seriously, respectful, hardworking gentleman who were a pleasure to have around. And now, I have the pleasure of looking out at your beautiful work every day. Even my landscaper called to say, Ruthie, I see a lot of backyards, and the work you’ve done is spectacular. The material was selected from your natural stone showroom, we decided on the natural 4 pieces random and for the raised patio walls and the bbq walls and the fire pit we decided on the Nicolock mini colonial wall golden brown. Steps and walkways connect the new house patio and the pool patio. It is a drastic change from the original wood deck to this new Gappsi designed and installed patio. So thank you, Giuseppe. You run an excellent organization. We had our swimming pool and masonry work around it designed and built by Gappsi. From Giuseppe designing the backyards to patio and steps we saw our pool area coming together like a puzzle. We were thinking about using concrete pavers until we saw the travertine pavers at the Gappsi show room. We decided to use the natural color 6×12 for the patio and full nosed travertine for the pool coping. We had several retaining walls built with Nicolock golden brown mini colonial wall. My backyard was a densely treed yard and now looks totally different than it did before we undertook this project – all for the best! All we have to do now is some more landscaping and it will be a paradise. Giuseppe worked very hard with us to please us, and we are very, very particular. He was very accommodating with what we wanted done. He is truly a gentleman and master mason and his crew worked very hard to complete this project at a extremely hot time of the summer. Both his crew doing the masonry work and the men that installed the pool were very hard working people and made every effort to complete the job to our satisfaction. We would like to thank Giuseppe once again for the beautiful job! Gappsi installed classico travertine for our pool patio and built steps for both of the sliding doors in the backyard that come on to the pool patio. With tan bland Hanover walls and they used travertine full nose for the pool coping. I am absolutely thrilled with my backyard. He and his team made sure every detail was attended to and every issue resolved. We were planning on getting a swimming pool in 2007for many years, and therefore had many, estimates by other pool companies. I originally had no idea that Gappsi installed pools, until a friend recommended Guiseppe. We called on a Saturday morning to set up an estimate and Guiseppe showed up at 2 pm that day! Because of Guiseppe’s clear vision and honesty in explaining the cost of everything, we were sold. We started the permit process and the pool was started 1 week after getting the permits. We have 4 children who were more than anxious for their pool to be done. The hole was dug on May 5th and my kids were swimming in their pool on June 6th. As for the paving….the job was far superior to any other paving job we have had done. The men were meticulous and extremely professional…every cut is … for many years, and therefore had many, estimates by other pool companies. I originally had no idea that Gappsi installed pools, until a friend recommended Giuseppe. Because of Giuseppe’s clear vision and honesty in explaining the cost of everything, we were sold. We started the permit process and the pool was started 1 week after getting the permits. We have 4 children who were more than anxious for their pool to be done. The hole was dug on May 5th and my kids were swimming in their pool on June 6th. As for the paving….the job was far superior to any other paving job we have had done. The men were meticulous and extremely professional…every cut is perfect. As a matter of fact, I don’t even want the loop-loc cover because I don’t want metal screws drilled into my perfectly beautiful patio! I have recommended Gappsi to my friends and family and will continue to do so. Thank you Giuseppe for the beautiful addition to our back yard! Very Satisfied I had the Gappsi crew install a huge travertine patio around my new 18 X 34 foot heated gunite pool. They helped me decide on which my many options would be best, and I chose the travertine from their showroom, as this did not absorb heat from the sun and would be smooth yet not slippery when wet. I was not disappointed. They came on time, finished on time, and cleaned up after themselves. Most importantly, their price was significantly more affordable than any of the competition in my area, Peconic, NY. When I noticed some defects in the stone after the first season, a common occurrence with such stones as travertine, they came right over and seamlessly replaced those stones – without any extra cost to me. My only regret is that I did not find them sooner; I would have had them install my pool as well! We had Giuseppe do our patio, pool and walkway in 2000 with Nicolock pavers. His crew did a wonderful job and we loved their workmanship. Giuseppe himself designed the entire patio, pool, stone work and walkway. Actually, we gave him full go ahead to do the design and we could not have been happier. Nine years later we moved into a brand new home and of course needed to put a patio and walkway in our backyard. Also, we decided to add a fire pit. So in October 2009, we called Giuseppe to do the job. This time we used travertine and also let him design out the patio, walkway and fire pit. No doubt about it —– another terrific job. We could not be any happier with the job his crew did. I would love to put a pool in and if we ever do we would have Giuseppe do the job. We would highly recommend Giuseppe and his crew to do any and all patios, walkways, fire pits and pool stone work. Thanks Giuseppe for another great job!!!!!! Well done Giuseppe!My wife and I were interested in a backyard swimming pool and patio design. We considered this to be a major investment to our home and were unsure of the material, layout and design to use so we relied on Giuseppe’s talent. He took the time to explain what materials were available, the type of layout that could be accommodated in the space and a drawing. We were very pleased with the outcome. The multilevel patio really pulls together the beauty of the entire backyard. Once onsite, Giuseppe exceeded our expectations by delivering additional design elements to enhance the overall layout at no charge. We would recommend him highly as our neighbors have also become a customer. Seaford, Driveway & Complete backyard We hired Gappsi 2002 to do our driveway and porch in paving stones…we were so pleased with their work, we hired them again about in 2005 to do our complete back yard, including an island for our BBQ, sink, fridge and even an ice maker. From design concept to completion, working with Gappsi was a pleasure. Everyone that comes to our house admires the beautiful details and workmanship of the job. We don’t even have to verbally recommend them, our house speaks for itself!!! We have used GAPPSI for our backyard masonary pool and patio area, fence repair of existing front stoop & walkway and have been given the utmost professional service I would highly recommend them. From the supervisors, workers and office staff.